If you aren’t familiar with the concept, a rain garden‘s purpose is to expedite replenishment of groundwater and to reduce pollution by harnessing the filtering power of soil and plants. In a residential setting, the homeowner chooses a site for the garden, perhaps where water tends to naturally flow or accumulate during heavy rains, but in general it’s sited between the house and wherever the water returns to the storm runoff system. The ground is excavated between 3 and 6 inches below the normal soil line, and the soil is amended with generous amounts of organic matter to create a filter bed. Swales help direct the flow of water into the rain garden and berms slow the flow out of the garden. The water sits there and drains into the surrounding ground slowly, filtered by the soil and the plants’ roots. The plants chosen for the bed should be resilient, able to withstand about 3 days of waterlogged soil, but also be accommodating of periods of drought. The bed should not retain water for longer than 3 days, or else become a breeding ground for mosquitoes. Believe me, I have enough of those as it is. I’ve thought for some time that I should implement this technique in my garden, but inexplicably, the idea has grown from a casual to-do to an urgency. Yesterday was mild and sunny, so I took out the sketchbook and the landscape tape measure and began putting plan to paper. I’m no artist. Don’t judge. The sketch is certainly not to scale and not even entirely accurate in its general proportion, but we must start somewhere. 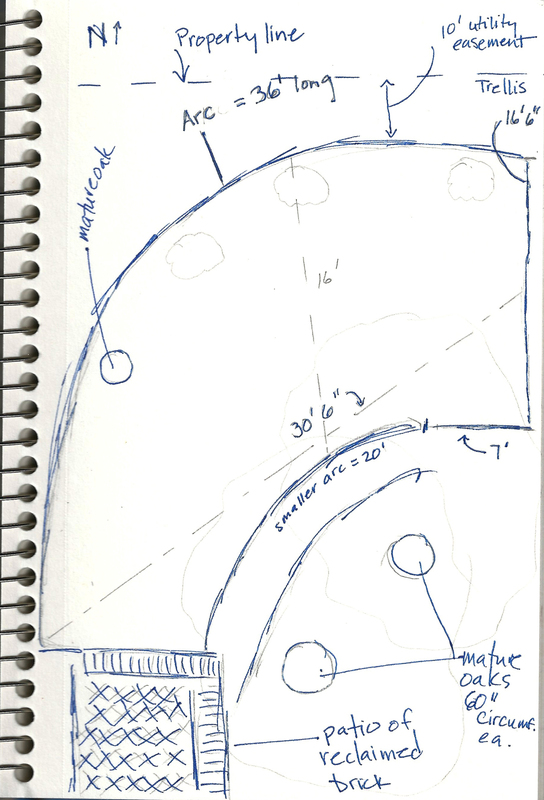 It’s a south-facing garden sheltered by two massive oaks in the lower right-hand corner of the sketch, 56 and 61 inches in circumference at chest-height. There is an unsuccessful trellis (16’6″) on the east side, which, if it were successful, would screen the children’s swingset from view (it’s okay; I can still see them from the kitchen window). The east side is 7′ deep before it begins to curve in its smaller arc (20′) towards a patio of reclaimed brick, made from the chimney we took down a few years ago. I’ll tell you that story some day. The outer arc is 36′ long. Most of these measurements are give-and-take a few inches, as I lacked a partner to help me measure. The property slopes downward towards the north. There are three existing Osmanthus shrubs, one Aucuba, and one Corylopsis pauciflora. There’s lots to think about before I begin to dig: Whether the surrounding trees could take the digging and the waterlogging (with our heavy clay, they can stay damp for a long time anyway, so ultimately drainage might be improved); existing plants that would need to be moved (I love rearranging furniture); the volume of water ultimately to end up in this garden. I propose to think out loud in this space, and I hope you will feel free to offer your thoughts and your experience as I move forward. I’ll add additional details on light exposure and so forth in the coming days. 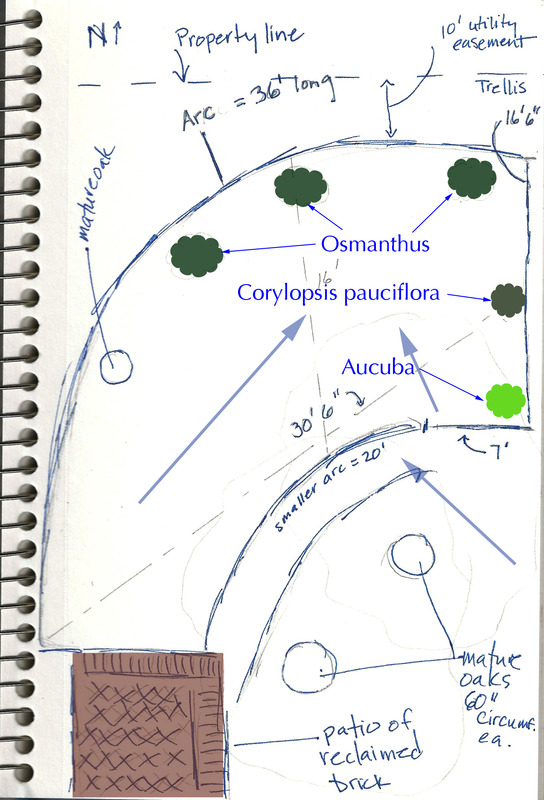 This entry was posted in 2013, Rain garden and tagged Aucuba, Corylopsis pauciflora, Garden, Osmanthus, Rain garden, Water by missinghenrymitchell. Bookmark the permalink. That is a great book. 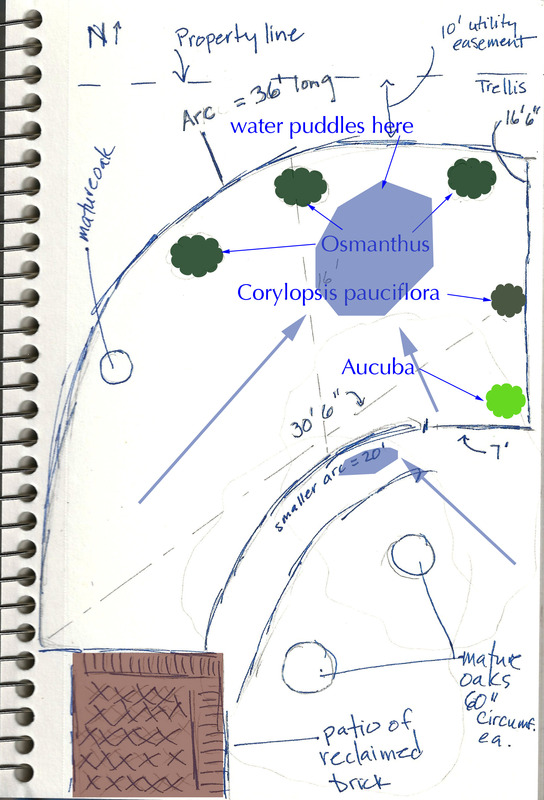 I’ve been reading it, in fact, as I think about and plan this garden.